What is Swine Flu ( H1N1) ? स्वाइन फ्लू क्या है ? It is an viral infection caused by any one of many types of Swine Flu Viruses. Other names of Swine flu are Pig Influenza, Pig Flu or Hog Flu in some local languages.It was termed swine flu because several years ago people affected with this virus were in direct contact of pigs. But during past several years, this virus is spreading humans to humans affecting the people who are not in direct contact of pigs. स्वाइन फ्लू कैसे फैलता है ? Swine Flu spreads pigs to person, or person to person. When people affected with Swine Flu virus talk, sneeze, cough, laugh, they create droplets. These droplets, which contain virus, suspend in air for some times and can be inhaled by healthy people and thus giving the entry to virus in their body. Affected people usually touch their nose and mouth with bare hands and then touch other surfaces like railing, door knobs, glass etc and leave the virus on those surfaces or objects. A healthy person who touch those surfaces and then touch his/her own mouth or nose can accidentally get flu virus. How Swine Flu does not Spread? स्वाइन फ्लू कैसे नहीं फैलता है ? What are Symptoms of Swine Flu? स्वाइन फ्लू के लक्षण क्या होते हैं ? In Humans, Swine flu symptoms in humans may vary from common flu-like symptoms like fever, cough, sore throat and muscle aches to pneumonia, Acute respiratory distress and other severe and life-threatening complications. Symptoms of Swine flu depend on many factors including immunity of infected person, strain/type of virus causing the infection, age, any other co-existing diseases. How Swine Flu is diagnosed? स्वाइन फ्लू को पहचाना कैसे जाता है ? Clinically, it is difficult to differentiate Swine flu from common flu or other flu like diseases because symptoms are almost same. Proper History taking and history suggestive of coming in contact with an Swine Flu infected patient usually raise the alarm. Lab test can help in confirming the diagnose. A swab from Naso pharynx is taken and sent to Lab for examination where presence of Virus can be ascertained and thus help in diagnosing Swine Flu. What is Treatment of Swine Flu? स्वाइन फ्लू का इलाज़ क्या है ? Swine Flu is a self limiting disease. Means, our body cure it by self. Most cases of Swine flu does not need any special care or treatment. Some cases need supportive and symptomatic treatment. Some Serious cases and in cases with compromised immunity, patient need Anti-Viral Drugs. Commonly used Anti Viral drugs include oseltamivir and zanamivir. But these should not be used without proper medical supervision. स्वाइन फ्लू साधारणतया खुद ही ठीक होने वाली बीमारी है मतलब हमारे शरीर की रोग प्रतिरोधक क्षमता खुद ही इस बीमारी को ठीक कर देती है। अधिकतर स्वाइन फ्लू के मरीजों को ख़ास इलाज़ की जरुरत नहीं होती है। कुछ मरीजों में लक्षणों के अनुसार इलाज़ की जरुरत पद सकती है। कुछ गंभीर मरीजों में और ऐसे मरीजों में जिनकी रोग प्रतिरोधक क्षमता अच्छे से काम नहीं कर रही है उनमें एंटी वायरल दवाइयों की जरुरत पद सकती है। आम तौर पर इस्तेमाल होने वाली एंटी वायरल दवाइयाँ हैं oseltamivir और zanamivir । परन्तु इन दवाइयों को बिना डॉक्टर की सलाह के नहीं लेना चाहिए। . What is not a treatment of Swine flu? स्वाइन फ्लू का इलाज़ क्या नहीं है ? 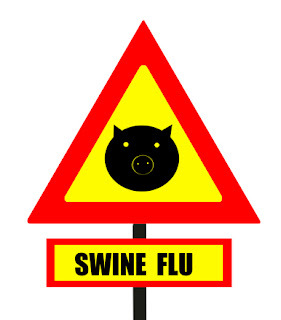 What is Ayurvedic Treatment of Swine Flu? स्वाइन फ्लू का आयुर्वेदिक इलाज़ क्या है ? In Ayurveda Various herbs are used for treatment of Swine Flu. These herbs can be taken in addition to Allopathic treatment. Proven herbs include neem , tulsi, ginger and pepper extracts. Some Medicines are also very effective in treatment of Swine Flu. These include Sitopladi Churn, Lakshmi Vilas Ras, Maha Lakshmi Vilas Ras. These medicine should be taken under supervision of a qualified Ayurveda specialist only. What is Homeopathic Treatment of Swine Flu? स्वाइन फ्लू का होम्योपैथिक इलाज़ क्या है ? स्वयं फ्लू से बचाव कैसे करें ? 1 ) Vaccination – Get yourself vaccinated for Swine Flu. One Shot a year can keep you safe from Swine Flu. Commonly available Flu vaccine does not have enough strength to protect against swine flu but if dedicates Swine Flu vaccine is not available, go for it. Avoid Handshakes. Use Namaste for greeting other people. 3) Be physically active, do regular exercise, keep yourself hydrated. What to do If I suspect I have Swine Flu? मुझे शक है है के मुझे स्वाइन फ्लू है। मैं क्या करूँ ? Remember, not every flu is Swine Flu. But if you have any doubt that you can have swine flu or if you came in contact with a person who is diagnosed with Swine flu now, consult your doctor and get the test done for same. A clinical assessment is necessary to see the severity of Flu. What to do If I am having Swine Flu? मुझे स्वाइन फ्लू हो गया है। मैं अब क्या करूँ ? If you are diagnosed with Swine flu, and symptoms are mild then take proper rest and keep yourself hydrated. If Symptoms are severe consult your doctor and start Anti Viral treatment. Follow all the instructions given by doctor and take medicines on time. Also, take precautions for prevention so that other people near you don’t get infected. Wear a recommended mask, cover your mouth and nose covered while coughing or sneezing.